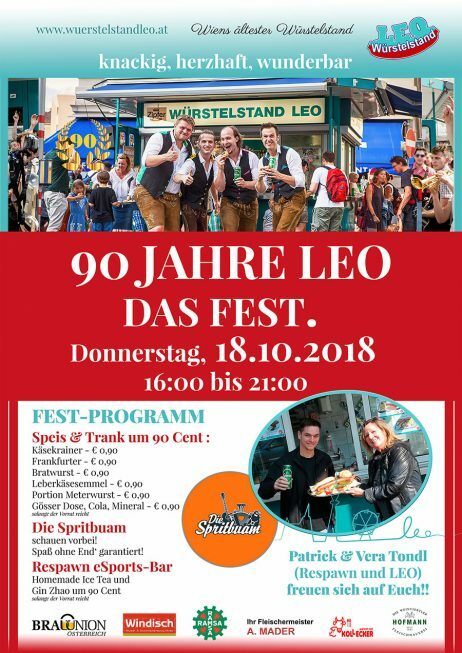 LEO, Vienna’s oldest sausage stand, celebrates its ninetieth birthday with a big party on 18th October 2018 ! Wurstelstand LEO was founded in 1928 and celebrates 2018 its anniversary year, proudly being 90 years young! The 90 years festivity takes place on thursday, 18th October 2018 from 16:00 to 21:00 hrs. There will be “90-cent-prices” for popular dishes such as Cheese Krainer sausage, Bratwurst, Frankfurter or Meat Loaf rolls. Specially for the occasion we will also offer the “Meter-sausage” known in old times.. 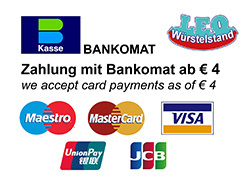 Beverages will be on 90-cent-offer at the party, namely Gösser beer can, Coke, mineral water. The visit of the SPRITBUAM promises extra fun! These musicians, stage professionals and LEO regulars had their internet breakthrough thanks to fun and meat loaf (“Spaß & Leberkas”) – the video of their debut-single VOLLEGAS LEBERKAS filmed at the wurstelstand leo counts 2,5 millions views!!! The SPRITBUAM birthday surprise is a Don’t Miss!! Vienna’s first eSports-Bar meets Vienna’s oldest wurstelstand… Vera Tondl manages the wurstelstand in third generation ownership and her son, Patrick Tondl – the fourth generation – opened the Respawn in close vicinity to the Wurstelstand. Now they will both celebrate the 90th Birthday of LEO (founded by their grand- and great-grandfather)… Respawn will offer Homemade Ice Tea and Gin Zhao for 90 cent. The whole LEO family and the Respawn are looking forward to seeing you all! All 90 cent offers while stock lasts.